It would seem that Spring has finally arrived. Not only did we have a beautiful warm sunny day on Saturday, today I woke up with streaming eyes and attractive red blotches all over my face. Ahh, hayfever. I love the smell of pollen in the morning. The results of my own marathon? My feet were a lot more comfortable at the end of it than those of many the runners yesterday, I'm sure. 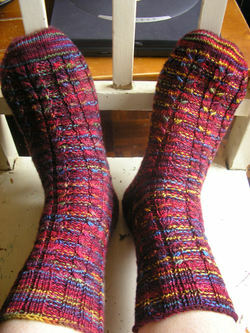 Yep, Sockapaloooza socks are done. I had a quick trying on session before washing and blocking them. Pattern: Badcaul - available as part of a trio from Anna. The pattern is wonderful - clearly written and with a stitch pattern that is easy to remember while still providing variety. I chose to cable without a cable needle, which is my preferred method for socks. The only change I would make if I was to do these again would be to make the heel slightly deeper, but that is just a matter of personal preference I think. Yarn: Fleece Artist merino in Jester colourway. Although both socks were knitted from the same skein, sock number two has significantly more yellow in it than sock one. I think Jill experienced something similar with her Fleece Artist. Am I right Jill? Needles: 2.25mm Surina wooden needles. These needles look and feel lovely but I found the points a little fragile. In fact I managed to snap the tip off one while putting the sock into my bag to take to Somerset. I was able to perform some emergency surgery with an emery board and normal knitting service was soon resumed. Finished: 23rd April 2005 - I blame the mitred squares for the long delay. Another Sockapaloooza over. Thanks to Alison for all the hard work in organising and running it. One more question - When's the next one? I like the sound of your marathon MUCH better. Congrats on finishing those lovely socks! Oh dear, i am currently training for a marathon. I hope i do not suffer a similar fate to Jade. Love the socks. Perhaps i shall knit a pair of "after marathon" socks. I am sure my feet will need it. they are beautiful - yum, fleece artist! 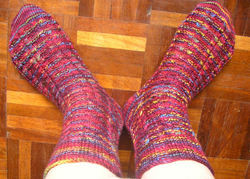 hurrah for finished socks! i have some 2.25mm surina wood dpns as well and have had the same experience with the tips. only i couldn't be bothered to try and fix them - instead i opted for the lots-of-swearing-every-time-the-yarn-snagged solution. The socks are lovely and even with the extra yellow in one (which to be honest I didnt even see) the color is just gorgeous!! Lucky pal!! Argh I agree, there's nothing so annoying as the snagging of gorgeous, soft yarn on sock needles. Mine were surina too, funny that. Maybe we had a dodgy batch? Jade didn't look too good did she? I saw her at 11 miles and she was walking then. Apparently she looked like she was turning blue and steaming from overheating, maybe one too many take aways and not enough training going on there me thinks. Those socks are lovely. Oh, the possibilities - all those wonderful sock patterns and gorgeous sock yarns! Lovely socks, wonder if I'll have the same colour effect? I found the surina dps splintered! Having said that I received a pair of short 4.5mm needles which are great, maybe it's the size of the needles? I see the yardage looks fine as well. Great socks. I love the colors! Your sock pal should be pleased. Here the pollen is so thick that you can see a yellow film over all of the cars if you don't wash them EVERY day. UGH. Those are really beautiful. That's the next pattern on my socks-to-knit list. :) Someone is going to be very happy with their socks! But congratulations on your marathon win! Those socks are really beautiful! oooh... pretty! I love the pattern! OHHH!!! They are gorgeous! Just LOVE them! Thanks for the link to Jade Goody on Wikipedia; gave me a chuckle. Lovely socks, too. Really. Cool Yarn. Really. Cool Pattern. Really. Lucky Sockpal. Congrats and very nice job. Considering buying a roll of batting.